The tax returns of President Donald Trump are back in the news, and a lawmaker from Butler is weighing in. 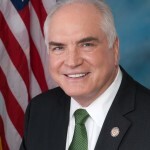 Republican Congressman Mike Kelly is a ranking member of the House Ways and Means Subcommittee on Oversight, which held a hearing Thursday regarding tax law relating to the tax returns of the President and Vice President of the United States. Kelly expressed concern about the potential use of a certain section of the law that would allow the release of Trump’s returns. Kelly argued this action would set a precedent that this provision of tax law could be used as a weapon against any U.S. citizen. In 1978, Congress established a process for Presidential candidates and other high-ranking government officials to report their personal financial information and potential conflicts of interest through the Federal Election Commission and the Office of Government Ethics. The post U.S. Rep. Kelly Weighs In During Hearing On Presidential, Vice Presidential Tax Returns appeared first on ButlerRadio.com – Butler, PA.